This one’s for the Children! I think many of us would think that someone who would run a double marathon, that's 52 miles, or 84 kilometres, is of a different breed. We might be quick to judge that person and consider them a 'running fanatic,' or at the very least a sucker for punishment! But what if that person was running 84 kilometres to raise awareness for a child sponsorship charity? 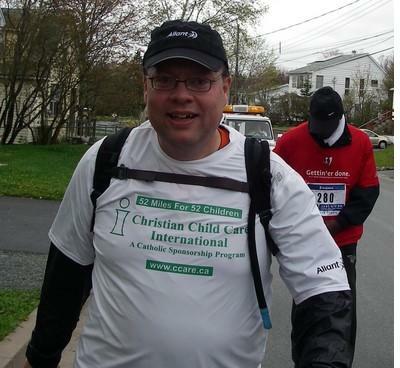 Derek Linders participated in Halifax's Bluenose Marathon -- twice -- in an effort to not only raise awareness for Christian Child Care International, but to also have 52 more children sponsored by this Catholic agency. "52 miles, for 52 children," he coined it. In fact, that's a picture of Derek above, taken by a friend of his, on the marathon course. On Thursday's episode of Catholic Focus (airing at 7pm & 11pm ET, and repeating on Sunday, June 3rd at the same times) we take a closer look at the Christian Child Care International. We'll hear from Derek and see how he made out on his double marathon, we'll talk with the Bodners, a family in Oakville, Ontario who sponsors a little boy in Haiti, and we'll chat with the founder of CCCI, Nova Scotia priest Father Patrick Cosgrove. In speaking about their involvement with CCCI, Laura Bodner told me that her family been experiencing a shift in their lives. That shift, she says, is from “What can I get?” to “What can I give?" Tune into Focus on Thursday (or Sunday) for more on Christian Child Care International. What you get in this episode, may move you to give!